On your marks, get set, volunteer! Once again, For the Love of the Lake is partnering with the Dallas Marathon to recruit course guides. 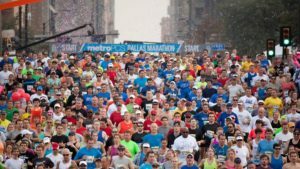 This year, the BMW Dallas Marathon takes place on Sunday, Dec. 9. We are hoping to get at least two people assigned to each spot. Course guides are posted at key intersections throughout the race to make sure runners stay on course. The race starts downtown and highlights the most vibrant neighborhoods in Dallas — including White Rock Lake Park! Since 1997, the BMW Dallas Marathon has raised $3.9 million dollars for the Texas Scottish Rite Hospital. Volunteer to support the Texas Scottish Rite Hospital for Texas and to show off our city. Send an email to dallasmarathoncontacts@gmail.com to volunteer.